Last weekend was the first one of the 2011 WSOP. While most of the heavy hitters were in Las Vegas, that didn’t mean the weekend online guarantees would not see their fair share of “name” competitors. Several factors combined into a perfect storm of an online poker weekend: the added interest generated by the WSOP and the fact that PokerStars major events kicked off a tad earlier, brought player numbers to pre-Black Friday levels. 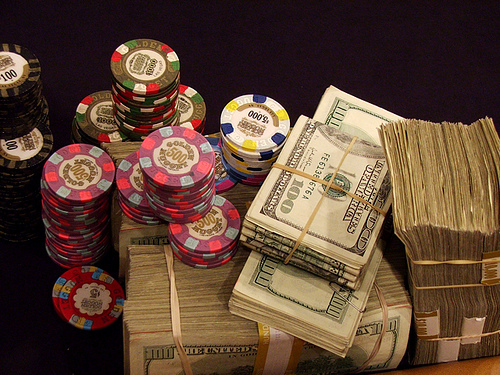 The results were equally impressive: no fewer than 7 players pocketed 6-figure prizes. The Sunday Million reclaimed its top weekend event status by yet again becoming responsible for the largest single haul of the weekend. Player “Diogene” was the one who walked away with the hefty $284k prize. The 10,237 players who registered for the event, combined buy-ins for a prize-pool of $2,047,400. No deals were made at the top, which allowed the eventual winner to optimally milk the tournament. Diogene bested Azazel1980 heads-up. The second place man did pretty well though too: he pocketed $204,740 for his efforts. Royalize, who finished 3rd walked away with $143k. The last 6-figure winner in the event was 4th place man Igor Kurganov, who took home $102k. The Sunday Warm-up saw more than 5k entrants too, its prize-pool shooting past the $1 million mark. Kojocki and eamsie finished 1st and 2nd respectively, after they struck a deal. Kojocki finished with $155k, while the second place man had to settle for $141k. There were no other 6-figure winners in this event. Over at Full Tilt Poker, the 750k guarantee managed to cover its target too, albeit by just a few tens of thousands of buckskins. The winner of this event, el_klonkador, pocketed $124k, becoming the only one to walk away with 6 figures from the event. Gavin Ball finished 2nd, rewarded with an $87k prize for his time.